As we wind down the month of January, 1/12 of 2019 is nearly complete. 2020 will be here before we know it! I’m kidding, of course. There are still plenty of things to look forward to in 2019. 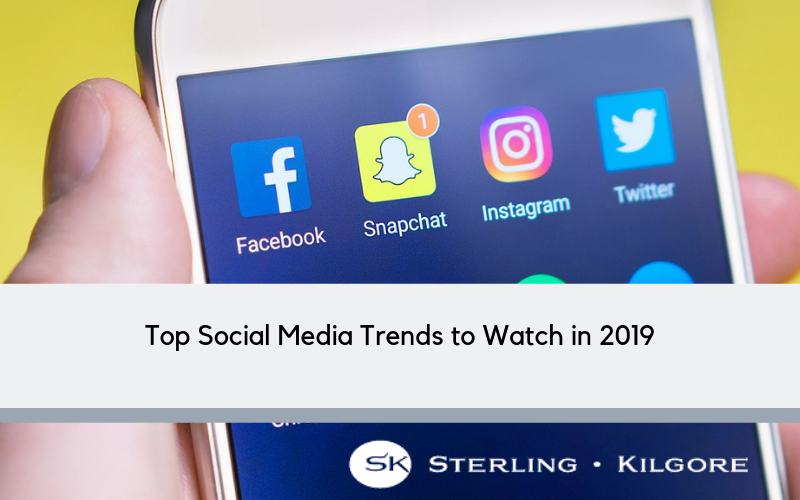 Here at Sterling Kilgore, we rang in the New Year with our blog about the Top 4 PR trends to watch in 2019 so it’s only fitting we also share what to keep an eye when it comes to social media. Quality over quantity. In the early days of social media, many brands thought the more tweets or Facebook posts shared per day the better. That has changed. Today, because we receive so much content, consumers want quality content that delivers value to them. Rather than trying to reach as many viewers as possible, content should be developed with the needs and interests of your audience in mind. Brand messaging will be supplemented by user-generated content. There are few things more powerful for brands than consumer advocacy and that’s exactly what user-generated content offers. Think of it as an opportunity to spotlight how much you love your customers! Sharing their content not only builds trust and credibility, it will also inspire them to continue engaging with you in the future. Whether your company is B2B or B2C, there are a variety of ways you can add user-generated content to your strategy in 2019. Visuals will take center stage in 2019. Video has been an unstoppable force in social for years now, and videos will continue to make a strong impact on purchasing behavior. The increase in mobile social media visits along with greater competition for your audience’s attention mean that you will need to grab their attention more quickly. Images and videos are a perfect way to do that. The rise of Stories. In my previous blog, I covered the rising popularity of Instagram and why your brand should incorporate it into your marketing strategy in 2019. A major component of the platform is the ability to post stories. Audiences love stories because they’re spontaneous, creative and provide a quick glimpse at what’s happening right now. For brands, it’s a great tool to build customer loyalty and keep your company top of mind on a daily basis. This is definitely a trend to watch very closely in 2019 as Instagram adds more features and enhances its live video capabilities! It’s already shaping up to be another innovative year in social media and our team is here to help ensure your brand maximizes its efforts before 2020 starts knocking on the door!